As in the tabernacle, the Solomon's Temple consisted of three parts: the porch, the holy place, and the holy of holies. The front of the porch was supported, after the manner of some Egyptian temples, by the two great brazen pillars adorned with lily-work and pomegranates. The places of the two "veils" of the tabernacle were occupied by partitions, in which were folding doors. The whole interior was lined with woodwork richly carved and overlaid with gold. Indeed, both within and without the building was conspicuous chiefly by the lavish use of the gold of Ophir and Parvaim,that glittered in the morning sun. Above the sacred ark, which was placed in the most holy place, were made new cherubim, one pair of whose wings met above the ark, and another pair reached to the walls behind them. In the holy place, besides the altar of incense, which was made of cedar overlaid with gold, there were seven golden candlesticks instead of one, and the table of shew-bread was replace by ten golden tables, bearing, beside the shew-bread, the innumerable golden vessels for the service of the sanctuary. 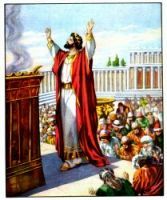 The outer court of Solomon's Temple contained an inner court, called the "court of the priests," but the arrangement of the courts and of the protocols and gateways of the enclosure, though described by Josephus, belongs apparently to the temple of Herod. In the outer court there was a new altar of burnt offering, much larger than the old one. Instead of the brazen laver there was "a molten sea" of brass, a a masterpiece of Hiram's skill, for the ablution of the priests. It was clled a "sea" from its great size. The chambers for the priests were arranged in successive stories against the sides of the sanctuary; not, however reaching to the top, so as to leave space for the windows to light the holy and most holy place. We are told by Josephus and the Talmud that there was a superstructure on the temple equal in height to the lower part, and this is confirmed by the statement in the Books of Chronicles that Solomon "overlaid the upper chambers with gold." Moreover, the altars on the top of the upper chamber were apparently upon the temple. The dedication of the temple was the grandest ceremony ever performed under the Mosaic dispensation. The temple was destroyed on the capture of Jerusalem by Nebuchadnezzar, B.C. 586. 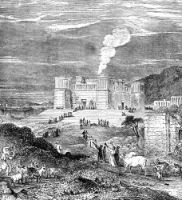 These illustrations of Solomon's Temple are from several biblical and historical books. Feel free to use these pictures of Solomon's Temple in your artistic creations. Click on the drawings below to see more details about saving a free Solomon's Temple image or about purchasing an image of Solomon's Temple at a higher resolution.